This large and angular powerhouse of a phone has a great screen, but is somewhat old school in appearance. The latest Google Android OS is as easy to get to grips with as ever, and the capacitive touch-screen is accurate and responsive. The internet and GPS features are superb, quick and fluid. Push-email is easy to set up for Google and Microsoft Exchange, but other accounts are not served as well. The camera is capable – a big move for a Android phone. The Motorola Milestone’s massive processing power means multitasking doesn’t bother it at all, with no slowdown or lag. Unfortunately, the battery lets down the powerful features – ours turned itself off after one day. The Motorola Milestone was meant to mark Motorola’s triumphant return to the smartphone scene, and it’s certainly a powerful device: it runs the latest version of the Android OS, is a multitasking demon and one of the fastest internet phones available. But it’s hardly the most stylish of phones – in fact, it looks like an old-fashioned PDA, with the size to match. It’s powerful processing skills are no excuse – the iPhone put paid to the idea that power equals size for good. And with none of the stylish touches that grace recent Android phones like the Sony Ericsson Xperia X10 and the HTC Bravo, the Milestone may struggle to compete. 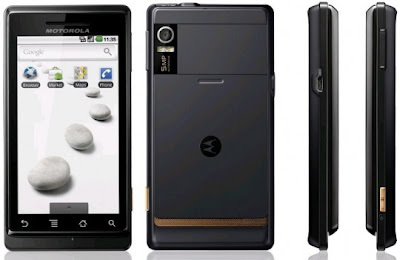 If we were being polite, we would describe the Motorola Milestone as old school, but while the look may be dated – a large, angular body with bronze detailing on the back speaker and D-pad – the build quality is excellent. The slide-out QWERTY keyboard has well-placed number and symbol keys to make tying a breeze, a dedicated shift key – a bonus for those who like grammatical texting – and an Alt key. The whole thing is similar to that email giant the BlackBerry. Unfortunately, the Motorola Milestone’s keyboard can’t compare. Sure, it’s tactile, but a D-Pad stuck on the side makes it a little too long, and the keys are quite heavy, making fast typing more difficult than on handsets like the BlackBerry Curve, or the touch-screen keyboards found on the HTC Hero or iPhone. The Motorola Milestone has a bumper 16GB of internal memory and, if that’s not enough, you get an 8GB microSD card bundled in. In terms of connectivity, you have a miniUSB port, a 3.5mm audio jack (more important that many manufacturers seem to think), and joining those of the sides of the phone are the camera release button and volume/zoom tabs. The camera is the best one we’ve seen on an Android phone yet, although that’s hardly a recommendation. The Android 2.0 operating system at least supports a flash, which is new, so you get a five-megapixel cam with dual LED flash and autofocus. Unfortunately, the image sensors are about the same, meaning colours are slightly off even with daytime shots. Lowlight shots are far better, though – the LED flash does a pretty good job here. It won’t replace your dedicated camera, but will suffice for those out-and-about snaps, especially as the shutter release doubles as a launcher, giving you quick access. The capacitive touch-screen measures 3.7 inches and covers most of the Motorola Milestone’s frontage. The only hardware are four buttons along the bottom of the screen for back, menu, home and search. There’s no call or end call key, but a preloaded shortcut takes you through to the dialler. That does mean a couple of extra clicks if you even want to call back your last caller, though. One great little phone feature is a sensitive proximity sensor that that turns of the screen when you put it to your ear and turns it back on when you move it away – this is useful when your are calling voicemail or any other feature that requires you to enter numbers on a virtual keypad. The internet and GPS features are the Milestone’s central features, and rightly so – they are incredibly fast and the best you can get. It’s one of the fastest internet phones we’ve used nad it’s superior processing power meant we could run the internet browser, messaging, Twitter and maps with no reduction in speed at all. There’s no delay between pressing your icon and launching an app, and using the phone is always immediate, intuitive and smooth. The full HTML browser handles even the most content-heavy web pages with ease, and browsing is made comfortable thanks to that 3.7-inch screen and the multi-touch zoom function. Pictures and fonts are clear and sharp, and the touch-screen allows for accurate hitting of hyperlinks. Other than the lack of tabbed browsing, this is the nearest thing to a perfect mobile internet experience we’ve had. Of course there’s a catch – there generally is – and in this case it’s the battery life, which is pretty poor. When we ran Facebook and Twitter in the background with frequent use of the browser, the Motorola Milestone switched itself off within a day. For an internet-centred phone, it could really do with a better battery. The Motorola Milestone’s GPS receiver is fast and accurate, and it found our location down to the door number even when we were inside the building. Google Maps is included, although there’s no voice navigation feature (this is reserved for users on the other side of the Atlantic). To make up for this, Motorola has included its own navigation software, MOTONAV. This is a fully-featured package with both car and walking directions which comes with free Europe maps and a 60-trial of the Premium service. But the free stuff is good on its own, offering options to look around cities, find places around a cursor and send maps and directions by SMS or email. You can search for locations including restaurants, petrol stations, accommodation and parking, and when finding a route you can filter motorways, tolls, ferries and unpaved roads. Keeping MOTONAV discrete from Google Maps is an odd decision, as the mapping functions would make more sense together. And you can’t turn on GPS from MOTONAV either, meaning a few extra clicks to accomplish this simple task. You can download on/off auto-GPS switches from Android Market, but plenty of other GPS phones have managed this without difficulty. Being a Google Android device, the Milestone’s Gmail access is an outstanding, desktop-like experience, and the QWERTY keypad makes typing messages easy. Google and Microsoft Exchange accounts offer easy-to-set-up push-email, but we’re surprised that push-email isn’t available for other email clients, even Hotmail. Set the send/receive notifications for the shortest interval possible and you will at least get regular updates, but that’s still only every 15 minutes. Another annoying twist is that even once you’ve cleared the notifications, you have to actually read the email to stop the phone sending you new notifications for the same message. Not fun for spam mails. As for social networking, you can get free apps for Facebook, Twitter etc via Android Market, but your notifications won’t be pushed to you like they are on phones like the DEXT. This is because the MOTOBLUR interface that made social networking such a breeze on the DEXT isn’t present here. Of course, not everyone is a social networker, and if that’s you, then you won’t mind the omission at all. The free Facebook app isn’t up to much either, as you can’t even direct-message your friends. You can view the news feed almost exactly like you would on a desktop, but profiles are lacking in information. However, you can link up Facebook to your phone contacts – theoretically at least. It didn’t work for us, but that may have been a glitch in our review model. You can also sync your contacts over-the-air with Google and Exchange, but moving contacts from a standalone Outlook account and you have to go in a roundabout way, by synching Outlook to Google. And the preloaded Phone Portal software, which can import contacts from Outlook, can’t sync your Outlook contacts to the phone. What you can do, though, is see everything you’ve done on your phone, from calling and text history to internet browsing. You can connect the Motorola Milestone to your PC via Wi-Fi, which is useful if you can’t lay your hands on your USB cable. The Milestone is impressively powerful, and its internet and GPS features are second to none. It’s bulky and lacks the usability of some other phones, but is a multitasking marvel, albeit one with a low batter life. It’s not everyone’s cup of tea, but if email and internet are your thing, it’s a great performer.